The N 2.2 bn fraud trial of former Governor Ayodele Fayose of Ekiti State and one Spotless Limited continued on Tuesday with further cross-examination of Mr. Musiliu Obanikoro, who is the fifth prosecution witness. Fayose and Spotless Limited are being tried on 11 counts bordering on criminal breach of trust , stealing and money laundering before the Federal High Court in Lagos. At the instance of Spotless Limited ’ s lawyer , Mr . Olalekan Ojo ( SAN ), Justice Mojisola Olatoregun had, in a ruling on Monday , admitted into evidence an extrajudicial statement made by one late Mr . Justin Erukaa, who worked as Special Assistant to Obanikor. In admitting Erukaa ’ s statement as Exhibit J , the judge overruled the objection raised by the prosecuting counsel for the Economic and Financial Crimes Commission, Mr. Rotimi Jacobs ( SAN ) , to the admissibility of the document. 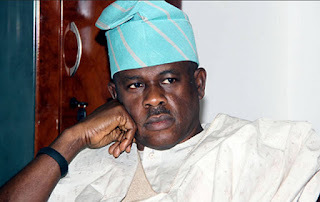 At the resumed trial on Tuesday, Obanikoro , while being further cross -examined by Ojo , affirmed that Erukaa died after he had made an extrajudicial statement to the EFCC. “ This Justin Erukaa, who was one of your Special Assistants , can you tell the court how you got to know about his death after making Exhibit J?” Ojo further asked.